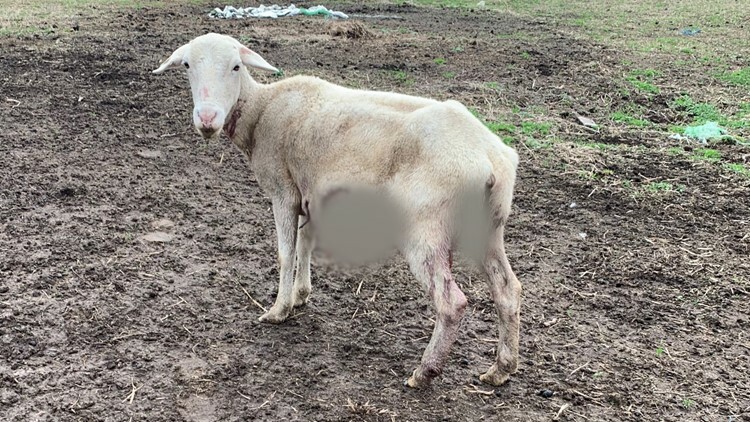 A family in Bullitt County is asking for answers as to what killed several of their sheep. LOUISVILLE, Ky. — "I couldn't believe it like I could not believe it," Cindy Esparza said, after her husband found some of their sheep dead on their property in Hillview. The family had about fifty sheep before five were killed, one was put down after life-threatening injuries and 7 were missing. "When he sent me a picture of the one that was still alive, it was horrible." They are looking for answers...what happened? What kind of animal did this? Where are they now? "He doesn't think it's a coyote because they usually are alone and just one coyote, it's way too many animals just for one." Cindy says the dozens of livestock are visibly shaken up and are spooked by what they saw last week. That has led to extra work for her husband, putting them back into the barn at night, and letting them back outside in the morning. With young kids on their property, Cindy says her and her husband are scared when they go to sleep. "What we're afraid of is, it can get anything. If it's getting such big animals it could get a child easily or an adult." Their 6-year-old son Cedric remembers the day vividly that he helped his dad bury his sheep. "When we were burring the sheep I was like a little bit sad because they died, it's like you won't have any animals to play with." If you have any information please contact animal control of your local police department to report your attack.